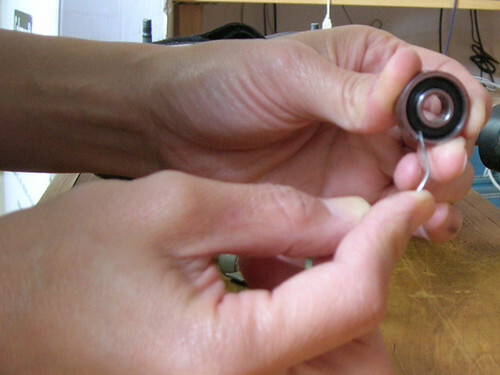 Bearings should be cleaned when they start to roll slower, or don't roll for very long when you spin them. How often that is depends mostly on where you're skating: bearings will get dirty pretty quick outdoors and stay pretty clean in a clean indoor space. Which the practice space is not, so I try to clean my bearings about every month. I've also heard that how clean you need your bearings to be depends on the top speed you need. 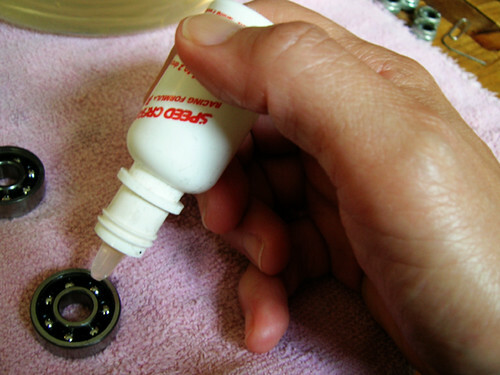 So like, speed skaters are pretty religious about cleaning their bearings. Even jammers don't skate as fast as that overall, and blockers even less so. But I don't regard bearings as being fast as much as easy to push: a cleaner bearing is easier to push, who wouldn't want that? Okay so these are instructions for cleaning one-sided bearings, which means they have a shield just on the one side. 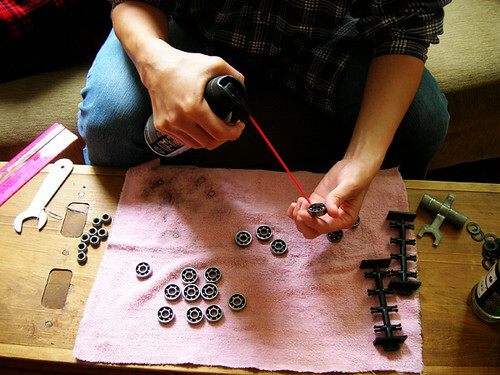 Bones bearings are one-sided; so in addition to being great bearings, they're easy to clean. 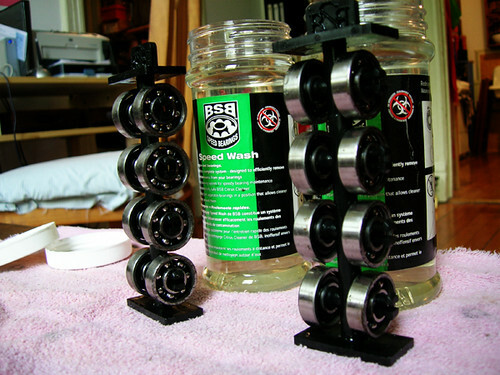 Bones does make a bearing washer, but I think the BSB Speed Wash System is better designed. One-sided bearings are great because you can just poke out the shields from the back, using a bent paperclip. I did not figure this out myself. You just work the paperclip through the back until it goes through, and poke, the shield pops out. With two-sided bearings you have to use a pin to pick the shield out from the front, which I never got good at. If you have sealed bearings, you just throw them away and put into new bearings. Tut, though. Then you snap the unshielded bearings on the washer stem, I bought two so that I could do all my bearings at once. The longer it takes or the fussier it is to do any task, the less likely I will do it ever. With two bottles, it's snap snap snap snap snap snap snap snap shake shake shake and done. By which I mean, you drop the stems into the washer bottle, let them soak for five minutes, shake them each for the length of a favorite song, and they're clean. The bottle comes filled with BSB Citrus Cleaner, which is pretty good. The other cleaner I've used is acetone, which dries better but which I melted the paint on the windowsill with. 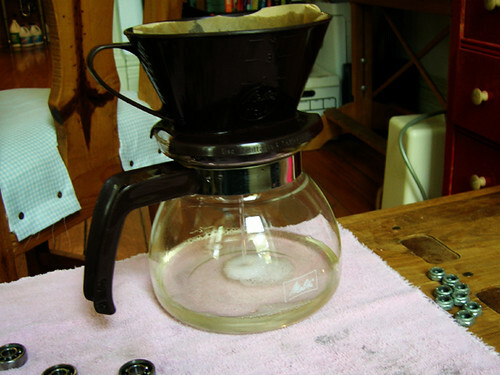 The cleaner can be reused, I filter it in, um, the sweetie man's coffeemaker. What. It's clean, it's cleaner! I might switch back to acetone when I've used up this citrus cleaner, because drying bearings is a pain. After I take my bearings out of the citrus cleaner, I wipe them on a rag and blow out any remaining moisture with canned air. But drying an entire set of bearings takes almost an entire can of canned air, which seems wasteful to me. So lately I've been drying my bearings with a blowdryer set on cool. Acetone evaporates instantly, so you don't have to do any of this. After the bearings are dry, the most fun part is spinning them and hearing that spinny sound. But then you have to oil them, and they don't sound as spinny after that. Bearings need oil, though. Don't be tempted to do without. I use Bones Speed Cream . Just one drop on one ball, then spin the bearing to get the oil all around. Then you press the shields back in place, and your bearings are ready to go back into your wheels.